Transportation/transshipment was essential to logistics, enhancing growing economy. 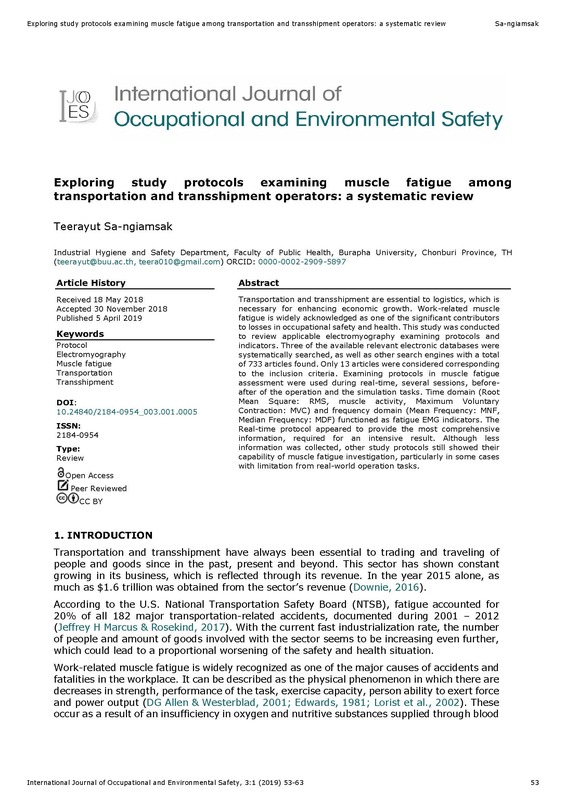 Work related muscle fatigue was acknowledged as contribution to significant losses in occupational safety and health. The study was conducted to review applicable electromyography examining protocols and indicators. The searches were achieved over 3 relevant available electronics data bases as well as search engines with 733 articles found. Only 13 articles were included corresponding to the criteria. To assess muscle fatigue; examining protocols during real-time, before-after and simulation of operation tasks were found utilizing. Time domain (RMS, muscle activity, MVC) and frequency domain (MNF, MDF) functioned as EMG indicators. Real-time protocol seemed to provide most information needed. However, other remaining protocols were still fairly selectable if no choice.